On November 12th, I traveled to Mississippi for a week with fellow ELI Gulf Team members Amy Streitwieser and Sofia Yazykova. We went to attend the 2018 Mississippi Restoration Summit, hosted by the Mississippi Department of Environmental Quality (MDEQ), but also planned to use the trip as a “listening tour,” meeting with representatives of local governments and historically marginalized communities to learn more about their environmental priorities. In light of the fact that I was new both to the Gulf Team, and to the Gulf itself, I embraced the listening nature of the trip and strived to hear rather than just be heard. Fortunately for me, the folks we met in the Gulf had a lot to say. In our efforts to hear from traditionally underserved local communities, we met with representatives from Mississippi Coastal Fisheries United (MCFU), the Biloxi NAACP, Boat People SOS (BPSOS), and the Education, Economics, Environmental, Climate and Health Organization (EECHO). In each of these meetings, we learned about the environmental and economic challenges community members face, and about their experiences participating in the Gulf restoration processes. We are grateful to the members of these communities who took time to share their stories with us, and we look forward to continued relationships with these partners. Our listening tour continued as we drove along the Coast to meet with several local governments and regional planning organizations. Utilizing the expertise of our new team member Sofia, who works on issues related to climate adaptation, we used part of the meeting time to understand how communities perceive the impacts of climate change along the Mississippi Gulf Coast, how they are responding, and how adaptation efforts and restoration activities may intersect. 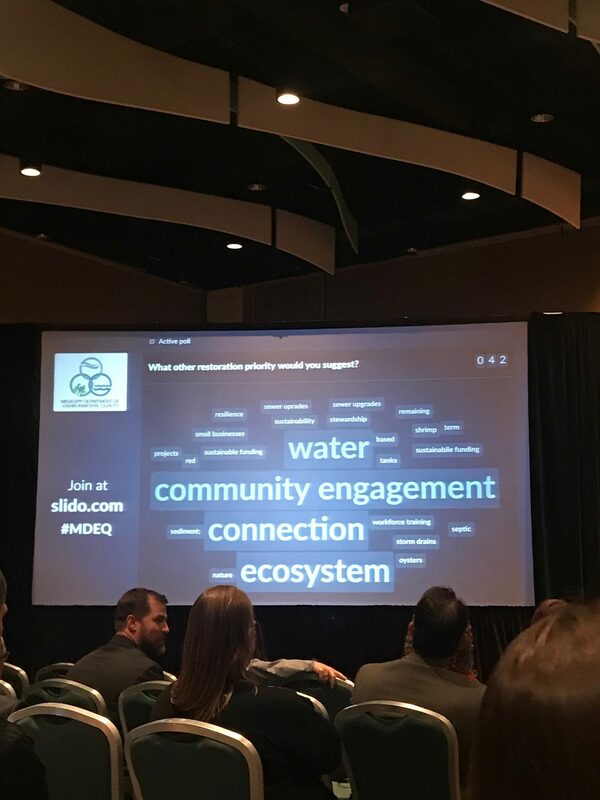 We heard that some common challenges coastal communities are facing include flooding, sedimentation, and water quality, and that local governments are interested in developing innovative and resilient solutions. On the evening of November 13, we attended MDEQ’s 2018 Restoration Summit, which included the annual public meeting of the Mississippi Trustee Implementation Group (TIG). The summit began with afternoon sessions on the “Blue Economy” and “Marine Living Resources,” which highlighted a range of projects funded through the Deepwater Horizon restoration processes. These sessions were followed by an open house, where attendees had the opportunity to chat with staff from MDEQ and other agencies involved in the restoration processes, as well as representatives from local university programs and conservation organizations; there was also a public comment station. Overall, the trip was eye-opening for our new team members, and it left me excited to continue working with communities engaged in the restoration processes, including by helping to identify how restoration projects may help ensure a healthy, resilient Mississippi Coast. We hope to be back in the area soon, but in the meantime, we can always be reached at gulfofmexico@eli.org if you have questions or would like to chat with us about Gulf restoration. 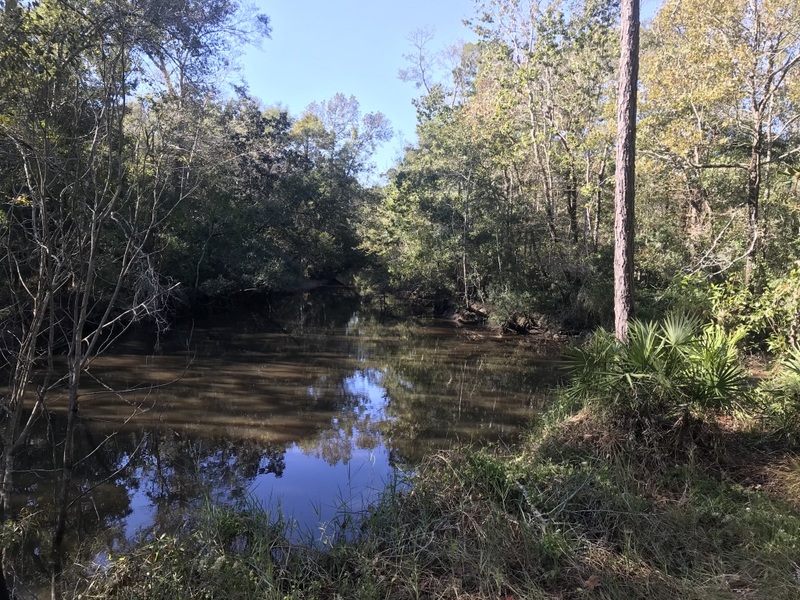 Photos of Turkey Creek and MDEQ Restoration Summit. Source: ELI Gulf Team.